1. To search your enquiries, go to Enquiries > View/Edit. Type in a date range which could be today until the end of the month, for example. Select your properties, then press "Filter". This will bring up any enquiries associated with your property. 2. 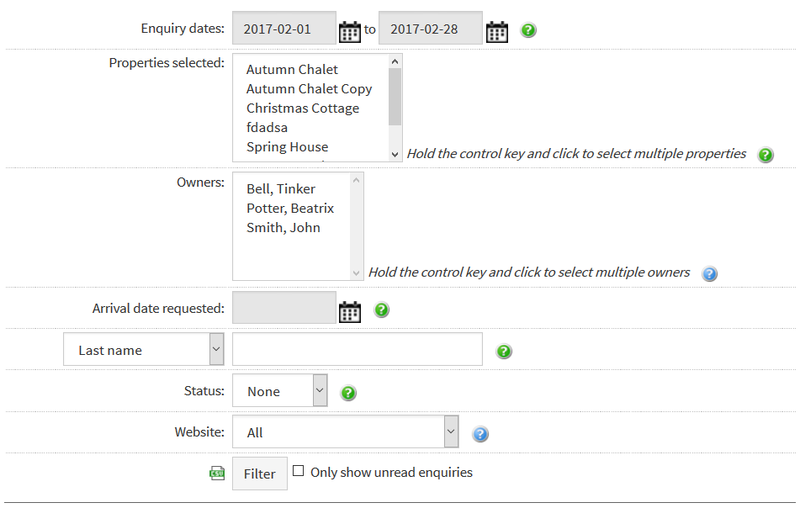 You can use the Arrival date requested calendar to search enquiries by arrival date. If you have had a cancellation, for example, you might want to view the properties that are now available on the requested arrival date. 3. Status: You can filter your enquiries by status if you reliably maintain this information. Select the relevant status from the drop down box and press "Filter". You can also filter by Custom form fields such as "pet friendly"; and it's possible to filter by Website. Prev: How do I set myself a follow-up reminder? Next: How do I convert my enquiry into a booking?